I've also become extremely aware of how often my skin is exposed to the sun. The rays not only cause burns and wrinkles, but also can lead to skin cancer. So scary! 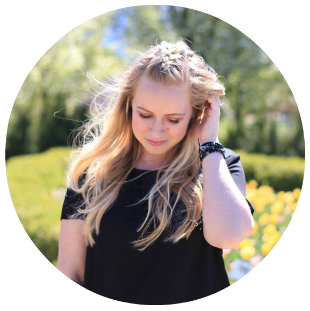 I have used a sunless tanner the the past few summers, since it provides an amazing glow. But, now JERGENS® has come out with a new product that takes care of all my skin needs! 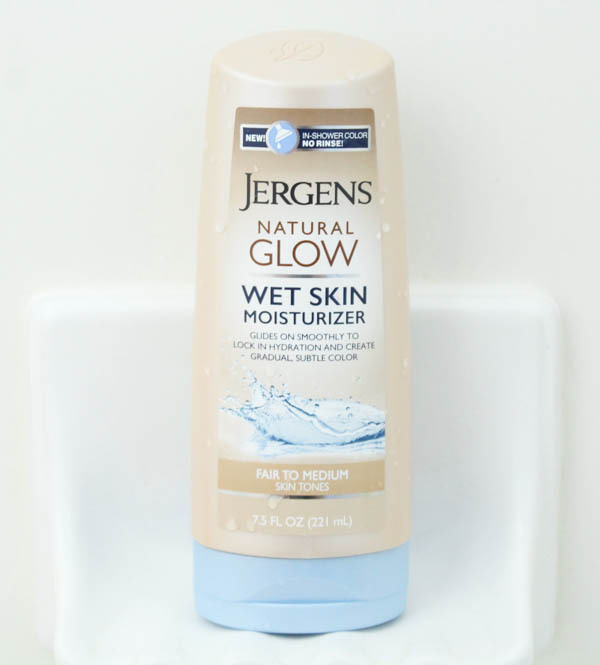 The JERGENS® Natural Glow® Wet Skin® Moisturizer is an in-shower gradual tanner, that moisturizes my dry skin while also giving me a beautiful glow! It helps me avoid all the self-tanner hassle. When I'm done with a shower and while my skin is still damp, I rub this moisturizer into my skin! The color takes about 3-5 days to develop, that way I can control the the shade I want for my glow. 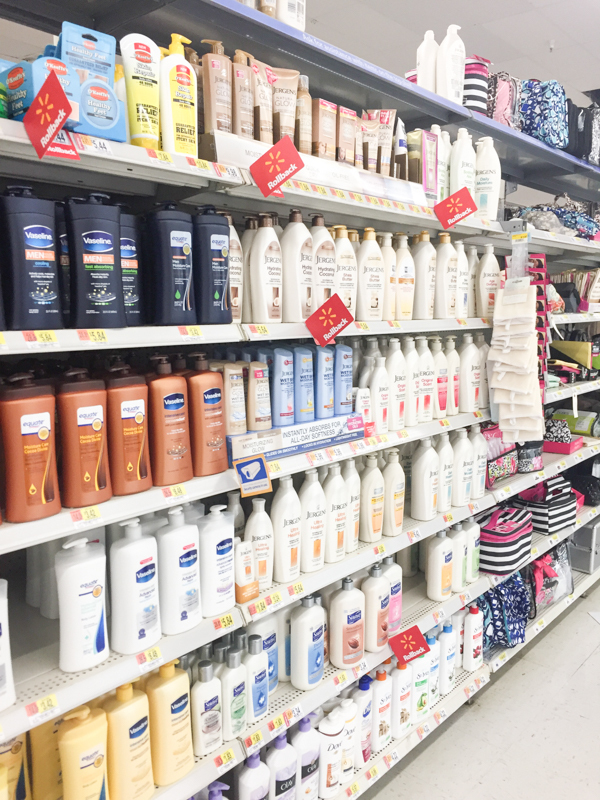 JERGENS Natural Glow Wet Skin Moisturizer needs to be applied when the skin is still wet, as that is when you can really see the benefits of both moisture and natural color. Another massive benefit to this product is that it does not get on your towels! Hip hip hooray! That is one of my biggest gripes when getting spray-tanned or using a sunless tanner, it stains all of my towel and clothes. 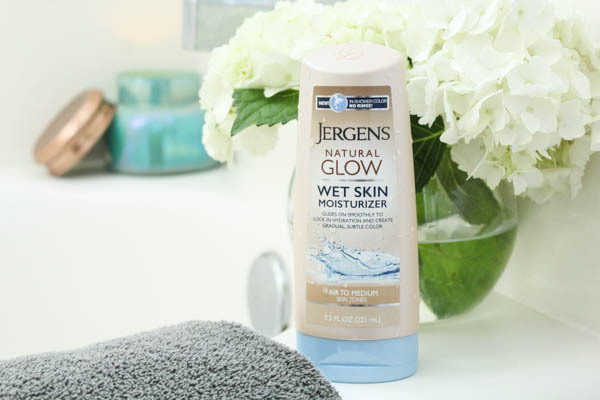 Right after using the The JERGENS Natural Glow Wet Skin Moisturizer, you can pat off the excess and head out the door! 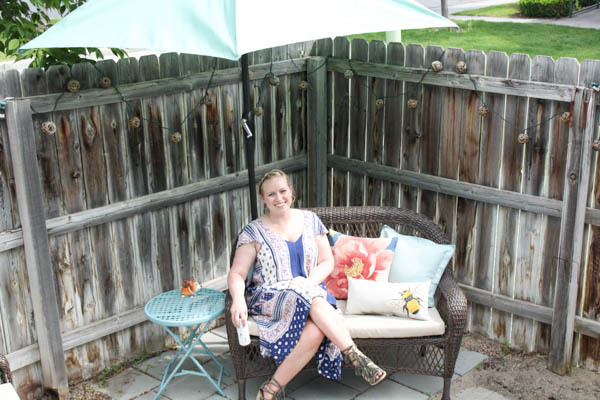 Now that our backyard is well on it's way to being done, we are throwing more backyard parties which means I gotta look the part! 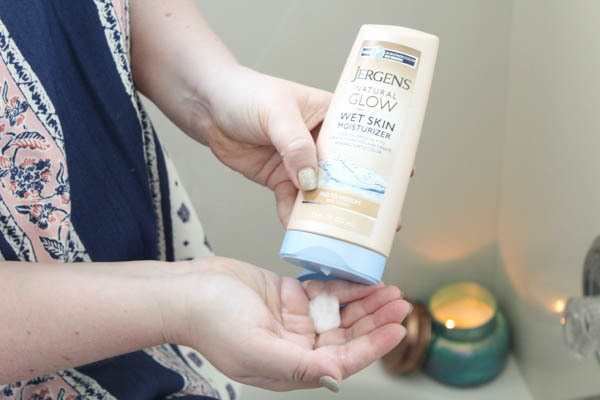 The JERGENS Natural Glow Wet Skin Moisturizer makes me feel confident in my skin and gives me peace of mind. I can now feel like a smooth tanned goddess without all the harmful sun rays, and that is priceless!